I wrote a blog post back in November 2014 about the reasons for choosing Berlin (over London) as the city to launch ChartMogul from. When I wrote the original post I’d only had around three months of living in Berlin to form an opinion. This follow-up is an attempt to give a more thorough look at the pros and cons of starting a SaaS startup in Berlin, drawing from the past three years of experience. Ecosystem: While I’ve only been here 3 years I can see that the technology industry and ecosystem is growing and maturing at a healthy rate, though SaaS is still not as big a slice of the tech industry here as it could be. 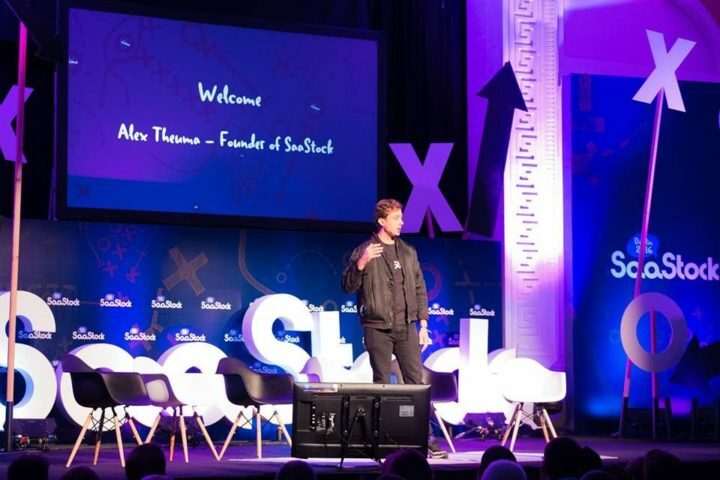 Although SaaS still feels like a minority in Berlin, European events like SaaStock are driving growth and awareness. Costs: Costs really are lower here, renting an apartment or office space is inexpensive compared with other tech hubs. For example, ChartMogul’s 200sqm (2,150 sqft) office only costs around €4K per month and is in a great location in central Berlin. Salaries: Salaries are lower on average in Berlin than comparable technology hubs, this means we can afford to pay at the upper-end of the pay spectrum, making us a more competitive employer. Talent: One of the most important factors for any technology startup is being able to hire the right people. Berlin is a good place to be when it comes to building a team, especially for engineering (it’s a place many engineers are attracted to move to). Many engineers in Berlin work for large (often Rocket Internet-backed) e-commerce companies, and working at a SaaS startup can be seen as an attractive alternative. Of course, some roles are tough to hire for here, especially senior sales and marketing executives (though this is a global problem as far as I can tell). Immigration: Germany is about as close to visa heaven as you could realistically hope for. Sponsoring visas for employees coming from outside the EU is very easy (I shouldn’t really call it sponsoring, it doesn’t cost us anything). The new employee simply makes an appointment at the immigration office (bringing with them their employment contract) and is (9 times out of 10) approved to start work immediately. We’ve never been unsuccessful in obtaining the necessary visas for people we wanted to hire from outside of the EU. We didn’t predict Brexit back in 2014 of course, but in hindsight it’s really lucky that we did choose pro-EU/pro-immigration Germany over the UK; out of our 20 team members we have 14 different nationalities represented (e.g. Australian, Japanese, French, Belarusian, Korean, Brazilian, Portuguese, Indian, British, German and others). This ability to hire the best candidate for a position, regardless of their passport, just wouldn’t have been possible in the UK. 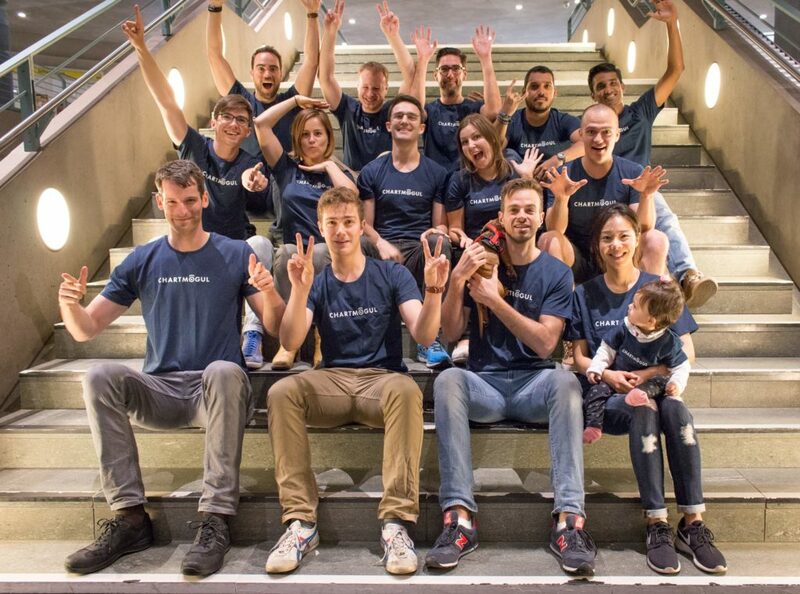 The ChartMogul team, which has grown a bit since we took this photo! Lifestyle: This point is pretty subjective, depending on what you’re into. But there are some things most everybody likes, e.g. not being crushed in overcrowded subway trains, or having a lot of options for eating out, and Berlin is great in these areas and many others in the lifestyle bucket. Also, I’m discovering (as the father of a 2yr old) that it’s a great place to raise young children, there are lots of parks and playgrounds (and other such facilities that make parenting easier). 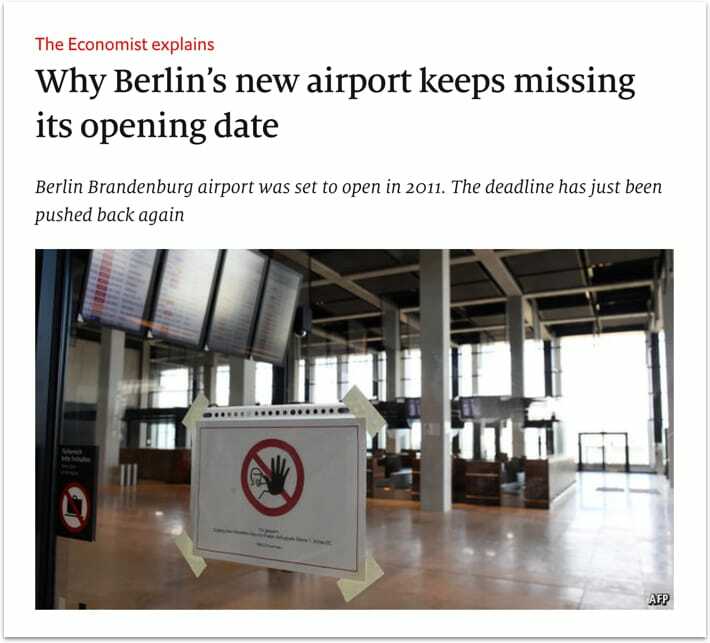 International travel: Originally planned for 2011, Berlin’s new Brandenburg Airport is still nowhere close to being open — the ‘German efficiency’ stereotype clearly not extending to large-scale public sector infrastructure projects. The silver lining is that some airlines have got tired of waiting and begun opening more direct routes from the ageing Tegel Airport to key destinations (at least for us) such as San Francisco (might be short-lived now Air Berlin have entered bankruptcy) and Toronto. Ease of doing business: Incorporating locally in Berlin and getting setup from a regulatory standpoint (e.g. employing people, filing financials, etc) consumed a lot of time and effort and was quite stressful (at least for a non-local/non-German speaker). We went through two accounting firms before finally finding one that understood our business and was able to deliver (I can highly recommend Tilango). At the end of our first year in Berlin I understood why the World Bank ranks Germany 114th (out of 190 ranked countries) on “Ease of Starting a Business” (while Germany ranks 17th for overall “Ease of Doing Business”). However, there is a silver lining. Once you are up and running things do run smoothly and reliably — just getting there isn’t super easy in the beginning. We now also have an in-house Director of Finance and Operations who (among other things) takes care of most of the regulatory side of running the business, this is really an essential hire for any non-local founder looking to do business in Germany. There is of course no perfect place to start a business, but if you are considering moving somewhere to launch a technology business I hope you’ll consider Berlin and find this post useful. Feel free to ask me any questions about running a business in Berlin in the comments below and I’ll do my best to answer. This post is a followup to Why we chose Berlin over London, which was published in 2014.